There’s no question that “giving a goat” has caught on, as a way of getting people to support charity – rather than consumer goods – for the holidays. I’d have unanswered questions about the effects this gift might have. Will the person who receives the goat be well-suited to receive it? Will they mistreat the goat? Will the goat produce enough to justify their investment in it? Will the local community perceive unfairness in who is chosen to receive the goat?We’ve found livestock-gift programs to be among the more poorly documented developing-world aid programs out there. We have little sense of whether and when these concerns apply. It’s not really a goat anyway. See our 2009 discussion of donor illusions: chances are, the fine print says you’re really just giving a donation to the charity, not any specific goat. Matching your dollars with a specific goat doesn’t (in our view) really make sense logistically, so we’re glad that it isn’t actually happening. I think there are much better ways to help people with donations. This is the most important point for me. Maybe “giving a goat” really does help people – but I don’t believe it helps them as much as possible given our other options. GiveWell’s top charities carry out proven, cost-effective interventions; they have strong track records; they have better transparency and accountability than any livestock-focused programs I know of. They can generate incredible value for your money, such as saving a life for $2000 or keeping someone worm-free throughout childhood for $5. Those are our best evidence-based estimates (the details are all online), not marketing pitches. Giving a goat means supporting the best story for donors, not the best solution for the people I want to help. If you agree that there are better ways to help people than “give a goat,” you should be worried about the message you send when you opt for the latter. To me, the whole point of “giving to charity for the holidays” is to take the focus off of our own wants and put it on helping people who have much more fundamental needs. This goal is cheapened if we support any charities other than the best we can find. We like the idea of giving to charity in someone’s name as a gift for the holidays. We’ve recently made this possible for our top charities. We just think these gifts should be made to the best charities possible. Have you seen this documentary? I haven’t (and I’m not affiliated with it in any way, don’t worry) because I just learned about it and I live abroad, but it seems relevant, and seems like it might be good. I agree with all your points. My only problem with the above is that the goats aren’t really competing with my planned charitable giving — they’re competing with bath sets and chocolate and silly socks. A charity goat (or a “goat couple” from Oxfam, my favorite engagement/wedding present) is adorable, and (as you point out) almost always isn’t really paying for a goat. If all my friends or family were GiveWellers, of course this would be moot; until I’ve converted them, the goats make it easier for me to get away with making a charitable donation for friends and family who’d normally be peeved if they didn’t get a present. Are your personal gifts a sufficiently large fraction of your income for it to be worth the trouble of turning gifts into charitable contributions? It might be easier for you to give personal gifts exclusively with giving the recipients what they would appreciate most and/or with a view toward enriching their lives and to deal with charitable giving separately. e.g. If you give $2000/year of goats to family/friends and giving goats is a quarter as effective as AMF then giving $1500/year of non-charitable gifts to friends and $500/year extra to AMF then the value of your charitable contributions remains constant. Would your friends/family rather have $2000 of goats or $1500 of gifts optimized for their happiness/enrichment? “optimized for their happiness/enrichment” — even if I forgive the technospeak, I find it hard to believe you really think the majority of gifts circulating at Christmas are such. The “goat” marketing for charities like World Vision probably pulls more people from the bottom of the charitable giving rungs than the top — in other words, folks who were not going to give anything to charity but rather were trying to find some food item or gadget to give to relatives and friends who are wealthy enough to buy all that they want as soon as they want it all year. If it acts as a bridge from rampant consumerism to the basics of real giving, I’d say its valuable for that alone. I don’t see why excellence has to be the sworn enemy of good. Parents give their kids money to put in the collection plate or salvation army bucket — why? Because the joy of giving can be awakened even if it is missing the necessary component of personal sacrifice at first. And once awakened, it can be salted with wisdom in time. I think Deborah makes very good points, especially about the alternative being silly socks and the like. While I am not sure of the giving a goat charity, the idea of helping those in need instead of getting some silly gift I don’t need that creates waste makes a great deal of sense. Psychologically it is helpful to make a present more tangible, tie it to paying for some specific kids education or funding solar lights for some specific village. Even if what is really happening is the charity gave thousands of dollars away and now the donations are being allocated to specific projects (that is the idea that my gift really bought that specific goat is a fiction) it is a useful fiction given the psychology of us people. This isn’t true for everyone, but it is true for many people. There is power in seeing a tangible link to what I do. And I think the “fiction” really can be more true than the “truth.” Yes, my gift may not really help the person they pointed out, but without my gift next year they can afford 1 fewer goat thus some person is without one. For those that don’t need the personal connection a gift to charity in someone’s name beats most gifts I have seen. I think gifts of toys etc. are great for kids. But a gift of paying for the schooling of some specific kid and letting them get to know what a life is like for someone like them is very valuable too – even if it is a fiction in a way. I like Global Giving – partially because it lets you target very specific small projects. http://www.globalgiving.org/ Of course I also support charities where I give money to big amorphous entity doing lots of good things where I can look at my money as paying for the staples for one office for a month or something. 2. The gift will make the recipient more likely to give effectively in the future. Of course the situation will vary from person to person but it’s not clear to me that either of (1) or (2) is true for the most part. On (1), it seems to me that a personalized gift such as a book, music, painting or sculpture is more likely to make more of a lasting impression and create a more meaningful relationship than a gift of a goat. On (2), I find it plausible that receiving donations as gifts will (on average) increase the recipient’s interest in giving and tendency to give. This is because it makes giving more salient and by slightly shifting social norms toward more giving. But I find the proposed bridge to effective giving to be much more tenuous. The the Money for Good study indicates that only ~ 1% of donations by made by US donors are made by donors compare and evaluate multiple organizations. This suggests that it’s very unlikely that the goat gift recipient’s hypothetical additional donations would be made with a view toward effectiveness. So I still think that it’s generically better to categorize gifts and donations separately than it is to give goats but would be interested in hearing any further thoughts from you on this point. I share Jonah’s worries about 2. I’ve seen no empirical research that provides evidence for 2 (but I hope researchers are investigating such possible causal possibilities). for the same sum total to someone I have a direct relation of kin or friendship to then I doubt that (a) could be overall more effective. In a personal interaction I can explain (b) and why I choose (b) over (a). I see it as a conversation starter about giving in ways that have the most effect. Those conversations usually bring out common, genuine thoughts and worries people have about aid in general. I don’t think the goat simply evaporates those worries – better to face them directly in conversation. Goats are not things. They’re individual lives. Where are these goats coming from? Are they pulled from their mothers and their herds? How are they transported? Will the poor people receiving them have the water, land, and supplemental feed necessary to take care of the goat? Goats are social creatures who form lifelong, meaningful friendships with other goats. They find comfort and safety in herds. Will this goat be alone his/her whole life? What if the goat needs veterinary care? What about the accounts of “gift” animals being stolen? Humane and more sustainable alternatives to “gift” animal charities are Feed More International (http://awellfedworld.org/feedmore) and Food For Life Global (www.ffl.org). This is what I call a creative idea. I wonder when the Germans will start sending goats as presents. Although it is creative, I hope that these animals are not suffering from it. Jonah: Given that it’s not clear whether or not giving goats is effective at all, I think it’s a stretch to assume that Heifer, Oxfam, World Vision, etc. are even a quarter as effective as AMF, SCI, VillageReach, etc. Ian: I agree. Making a careful case for this would go beyond the scope of a comment and so I was instead suggesting that even under generous assumptions there’s a case for not giving goats. saving a life for $2000 or keeping someone worm-free throughout childhood for $5. Clicking on the latter will lead you to a page about SCI where it reads > ‘We have not seen complete, year-by-year financial data from SCI’. We have not seen complete, year-by-year financial data from SCI…….? All, thanks for the thoughtful comments. I understand the argument for using “give a goat” as a psychological mechanism to get more others interested in charity, and I think the validity of this argument will depend on the individuals in question. However, if you are an impact-oriented donor, I think you should (a) discourage others from “giving a goat” to you, as opposed to giving to your preferred charities; (b) ask some of the following questions before “giving a goat” to someone else. Might it be possible to, instead of “giving a goat,” make a donation in the recipient’s name to the most effective charity you can identify, potentially starting a conversation as Rob outlines? 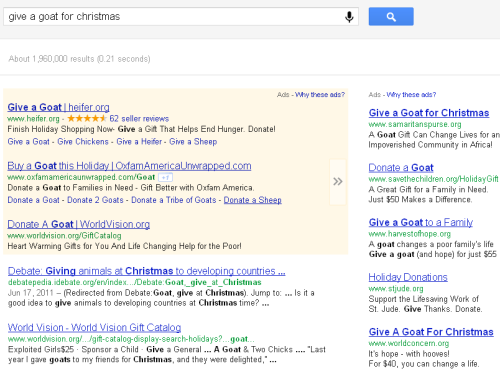 If the tangibility of the “goat” is important, can this effect be achieved – with some creativity – with another charity? If you’re happy with the idea that this tangibility is illusory anyway, and that the fine print indicates that the actual gift is general support to an organization, then why can’t this illusory tangibility and fine print be applied to the charity of your choice? Henk J.Th. van Stokkom: I think we could have written the sentence about SCI’s financials better, and we will revise the review to do so. We meant that we have not seen financial statements in the standardized form we are accustomed to; as a non-U.S. charity, SCI is not required to file such statements. However, we do have a strong understanding of SCI’s financials and we discuss the details in our review. You say “If you have any basic doubts like; ‘Will the person who receives the goat be well-suited to receive it?’ etcetera, simply ask.” Asking these sorts of questions is exactly what GiveWell does. But concrete, reliable answers can be difficult to get. Livestock charities haven’t published or provided good answers to our critical questions; our top charities have. As stated above, I agree that charities shouldn’t literally connect individual donors with individual goats. This post doesn’t advocate that they do so – it just points out that the tangibility of the gift (which most people on this thread have raised as the main reason to “give a goat” rather than giving to another charity) is illusory. “People I want to help” refers to the general class of “people who can benefit a lot from charitable activities.” It does not refer to specific people. You say “Giving cash is always the best option.” The central point of the 2009 post you criticize is that giving livestock seems inferior to giving cash. So I am not sure we disagree when it comes to the message of the 2009 post. Thank you for this post. I work for a development organization that in the past has taken “in-kind” gifts, such as school supplies. However, overtime we’ve found the most effective donation is indeed cash. Certainly, the students at our school need school supplies, but it does the community more good if we use donated cash, to buy school supplies from a local supplier. This bolsters the local economy and results in supplies for kids at our school. What about Heifer International? Their work is evaluated vigorously by independent evaluators of quality (http://www.heifer.org/google-search?s=evaluation) and they work with the recipients using good community development practices. It seems that you have a broad sweep that might require an exception. In Uganda — so probably elsewhere – we have had practical problems with goats. Children can stay home from school to care for them. They eat the seedlings in the school woodlots: trees are being grown for shade, windbreak, fuelwood for school meals, income for schools. Cathy Watson Straight Talk, Tree Talk, Mvule Trust — Uganda. Andy, see our 2009 exchange with Heifer International. We have seen evaluation of Heifer but cannot comment on it because it is confidential. We believe it should not be confidential. “It’s not really a goat anyway.” Haha, that’s precisely why I want people to get me goats 😉 Peter Singer donates to Oxfam and I put a lot of trust in his judgement, so I think that Oxfam Unwrapped gifts are an excellent thing to ask for (alongside AMF donations). All this discussion surprises me a bit. I was a volunteer for Heifer International a few years ago and they answer most of the questions that this poster says he doesn’t know about. In the very beginning (1940s) a cow was given as an alternative to powdered milk that was handed out day by day. For years, animals have been purchased as close to the receiving village as possible. They are acclimated to the area and the money goes to a local farmer. It can be a year or more before the village receives the appropriate animal, so that the recipients can be trained in how to feed and care for the animals, and to create accurate reports. Regional agriculture and vets do the training. Goats are generally kept in a pen and walked to graze. I know several people (one is a vet) who have seen Heifer projects in action in Peru and Africa. I visited one in El Paso. The work is thoughtful and targeted.